The Honourable Tim Fischer AC is the former Deputy Prime Minister of Australia and was the Australian Ambassador to the Holy See for 3 years until January 2012. 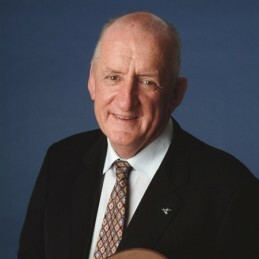 A former Australian Army Officer serving in Vietnam, NSW State Parliamentarian, Leader of the National Party and Minister for Trade, Tim Fischer is also a consultant, company director, author, broadcaster, and multiple patron. Tim Fischer worked closely with the Vatican on all aspects of the Canonisation of Australia’s first saint, Mary MacKillop and authored a book on his Vatican experience, “Holy See, Unholy Me”. Mr Fischer is currently a member of the Fred Hollows Board and was the Mayor of the Paralympic Village at the Sydney 2000 Paralympic Games. Amongst other honorary activities, Mr Fischer is also Chair of the Crawford fund on International Agricultural Research, and Ambassador to The Year of the Outback 2002 and The Year of Ecotourism 2002, and serves on two Advisory Boards (Cognita Singapore and Global Crop Diversity Trust Bonn/Svalbard, Norway). He is also Australia’s Special Envoy to the Kingdom of Bhutan, having stepped down as Envoy to Eritrea and South Sudan. A consummate and extremely versatile speaker, Tim draws on his broad range of experience in public and private life to deliver illuminating and informative presentations on everything from Gross National Happiness to Military Civilian Leadership and Infrastructure Excellence … and even his obsession with trains.